Children’s imagination and attention span determine how long before a toy that has just been bought becomes obsolete. No matter how attractive a toy looks to a child, the test really happens once they open the package and start playing, so, obviously, a waste of money. Luckily, for this generation, there is the best mini drone that can always catch their interest. It is inevitable that children would always ask for something new because of what they see in the media. As adults, the best thing to consider when buying children a gift is how long a toy would be interesting for them. As a general rule of thumb, convince them to pick something that moves around. Those toys are proven to hold their interest for longer periods of time. That is the reason why drones are hot on the market these days. Children and children-at-heart do not get tired of playing with them because they are challenging and nice to look at. Mini drones are also better than the regular drones because of their portability, making them not just easy to carry around, but also allowing them to take fun and enjoyment anywhere they go. What, then, is the most awesome mini-drone for both children and children-at-heart? Below, three mini-drones are reviewed and evaluated in terms of their advantages and disadvantages. The verdict would reveal what the perfect mini-drone is in keeping their users busy and interested in a long time, giving you great value for your money. Newest drone upgraded with multi features, this 6-Axis gyro quad-rotorcraft flight can easily achieve various flight movements, and easier to control. More stable and more suitable for kids or beginners. 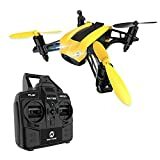 This mini drone is very suitable for indoor playing. 360°Stunt Flip: A key 360°roll, continuous roll for perfect action and wonderful performance. With the colorful flashing light, keep your aircraft flying excellently at night. One Key Take off / Landing: one button press automatically taking off or landing, remote control quadcopter will take off or go back to the position where it took off. It helps to protect the drone when it is out of control or low battery power. 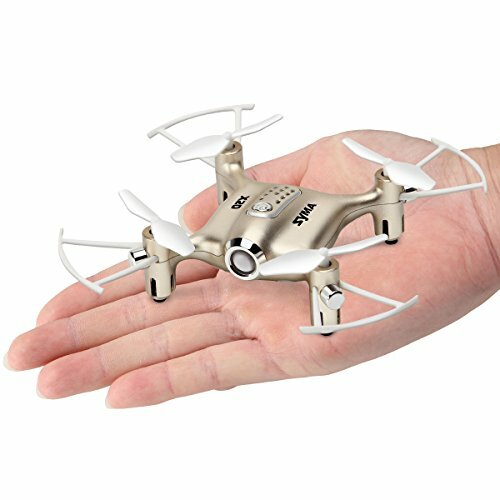 This mini pocket drone is the most affordable among the three types of mini-drones in this list. However, it is just a basic drone and does not have a camera or WiFi. It has a LED light, though, allowing the users to enjoy it even in the dark. It also has 6-Axis quad-rotorcraft flight, and a handy controller or transmitter with simple-t- use buttons and joysticks. Its size is 10.5 x 10.5 x 2.5 cm. or 4.13 x 4.13 x 0.98 inches, and it is equipped with a 3.7V 180mAh Li-Po battery. Its battery becomes fully charged after approximately 50 minutes and can run the drone for about five minutes. On the other hand, the controller also requires four “AAA” batteries, which does not come with the package. It has Altitude mode, Headless mode, speed adjustment, one-key 360-degree roll, and one-key return landing, making it the perfect toy for children at least eight years old. It can go up and down, forward and back, and can turn left and right. The Syma X20 Mini Pocket Drone is a unit that does not have lots of bells and whistles. It is easy to set up and use and does not require a lot of experience to fly. Bonus Batteries Double the Flying Time: Comes with 2PCS of Modular Li-Po Battery, high-performance, double your quadcopter's flight time. Functional Modular design, easy to be installed and stored, suitable for pilots of any level. Headless Mode for Beginners: Orientation of the drone is relation to the pilot. Easier to control and fly back when the drone is out of sight. You'll have total control for a straightforward flying experience. This drone from Holy Stone boasts of its powerful motors and high-voltage battery. It uses 3.7V 600Mah Li-Po battery, which charges within 90 minutes, allows the drone to fly up to seven minutes. This drone has five-speed modes, and because of this, the manufacturer admits that flying this mini-drone will not be easy for beginners. 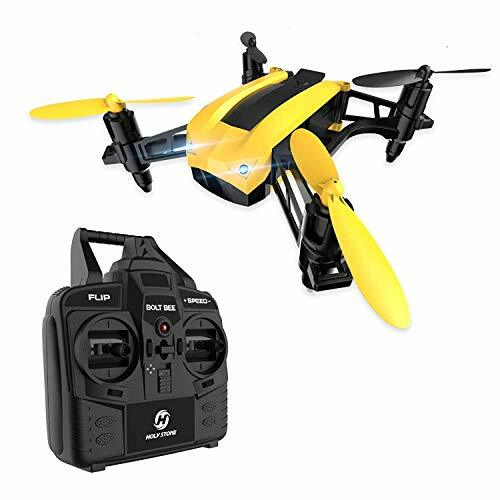 It also has 2.4GHZ 6-Axis gyro that allows for stable flying and avoids any interference in the transmission from the controller. This drone is headless, making it easy to navigate, and it can do 360-degree 3D flips just like other headless drones. The package comes with an extra battery, a charging cable, four extra blades or propellers, a screwdriver, and even a notebook for documentation. The size of the mini-drone itself is 5.71 x 4.25 x 1.77 inches, and it weighs 68.9 grams or 2.43 ounces., so there is no need to register it with the FAA. It must be noted though that this mini-drone, just like Syma X20 above, does not have a camera or WiFi connection. Coming in with multiple accessories, this is a great starter pack. However, it has multiple features that might not be suitable for beginners and children, so assistance from an experienced individual is required. 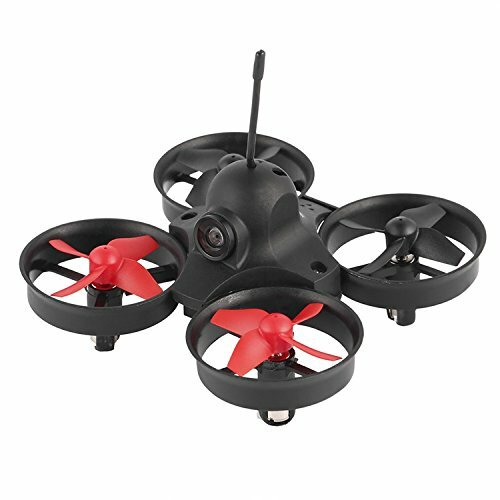 Among the three mini-drones, this is the only one that has a built-in camera, which is a 5.8G 25mW 48-channel HD type that captures clear pictures and videos. However, to connect with the camera, an FPV goggle or FPV monitor is needed. Likewise, the camera also shortens its flying time to only up to five minutes. The ARRIS Mini RC Quadcopter uses a 3.7V 200mAh 25C Li-Po battery for the drone unit while its controller requires only two AA batteries, which are not included in the package. What is more convenient is that it comes with a USB charging cable, and spare batteries are not hard to find. Its control distance is about 30 meters, and it weighs 83 x 83 x 58 mm. This drone can move forward and backward, up and down, left and right, can do 3D flips, and has high and low-speed settings. It also has a one-key return. One remarkable feature of this drone is that the propellers have a protective frame design to ensure the safety of curious children. Additionally, it has bright LED lights that allow the user to enjoy playing it even in dark areas. It has only one drone battery in the package, but spares are available. The ARRIS Poke Micro FPV Mini RC Quadcopter Drone is a mini-drone that can be used by children without worrying about their safety. Its camera and ability to work in different lighting conditions are great bonuses. When it comes to toys for children and children-at-heart, Syma X20 Mini Pocket Drone is the best mini drone among the three products reviewed. The ARRIS Poke Micro FPV Mini RC Quadcopter Drone may be the best for some because it is the only one with a camera, but it needs FPV monitors to be able to use it, and not everyone has that. In addition, the one from ARRIS is twice the price of Syma X20. They have almost the same features and functionalities, but Syma X20 definitely gives a bang for the buck. It is one of the toys that people will not get tired of playing for years to come.